Sixth traditional international regatta Impression Sailing Week 2012 on Elan sailing boats was organized by Burin Yachting Club in co-operation with Elan Yachting and Yacht Club Biograd. 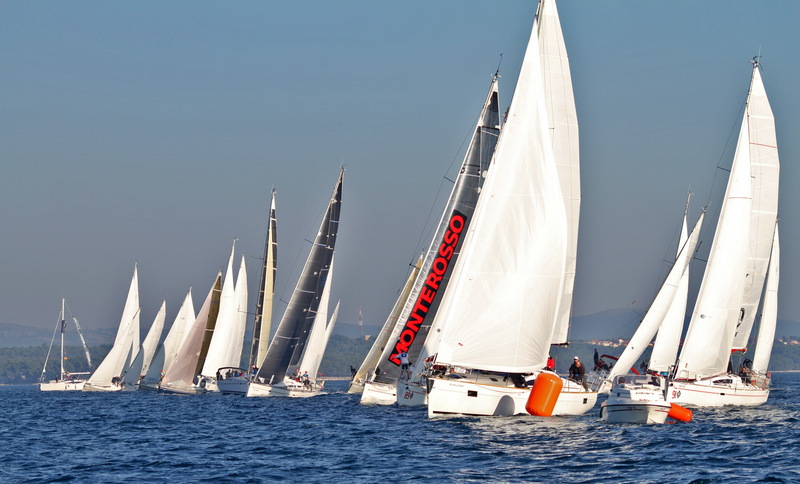 The event which is becoming more and more international was held in Marina Kornati in Biograd. This year the crews came from Austria, Hungary, Czech Republic, Italy and even from England, United States and Russia. The majority of the crews are still from Slovenia and Croatia. Around 400 people including skippers, crew members, press and other guests had a magnificent time during Impression Sailing Week 2012. Sailboats were divided in groups Elan Impression, Elan Performance and Elan Cruiser and inside Performance group they were divided in smaller groups, depending on the models of the boats. This year’s specialty was the possibility to apply for ORC classification inside the Performance group. Organizer held altogether four regattas. On Friday there was NW wind 10 knots, which made the ideal conditions for sailing. First of the Friday’s regattas was a technical one and the second one was navigational towards the finish line in front of the marina entrance in Biograd. Friday night there was Orange& Black Bat party with with Milan Terze and his band. Saturday’s regattas were followed by SE wind from 7 knots at the time of the first regatta to 15 knots at the second one. At this years regatta the company Smartivo powered by Cro Yachting installed gps tracking devices to the boats participating on regatta, so that all participants had the opportunity to watch clips of individual boats sailing in the regatta and their tactics at the evening on the big screen in the tent. In overall classification in Performance class third place went to Krka (Elan 410) KonTiki Slovenia steered by Sebastjan Levstik. Second place was earned by Sky (Elan 450) Navtika plus Slovenia with Marjan Kočila at the helm. By flawless sailing of JK Loka Timing with Karpo (Elan 450) steered by Dušan Ušeničnik brought them first place. The Transitional Cup is in the form of a 35 kg wooden steering wheel is staying with them fot another year. In Impression class third place went to Lu (Impression 394) Kuda sailing Team with Daniel Kušer at the helm. Second place was earned by Evolution (Impression 444), Neptun Yachting Slovenia steered by Iztok Svetina. Victory in Impression class went to Jordan (Impression 434) JK Loka Timing Slovenia with Stojan Vodopivec as their skipper. After all the cups were given away Smokva Wite Party broke loose with Marko Pecotić band. The regattas held by Burin Yachting Club and Elan Yachting became well known for generous prizes. This year they gave away Elan skis, a week’s sailing and many other technical equipment and sailing gear. The organizer received praise from participating crews for good organizing. Next year there is going to be a three-day sailing event between November 7th and 10th of November 2013.